The Air Zoom Odyssey features the Flymesh and Flywire upper for unmatched comfort. Most runners noted the amazing fit of the shoe, not too loose and not too tight. The Odyssey has a roomy toe box for wide or large-footed runners. 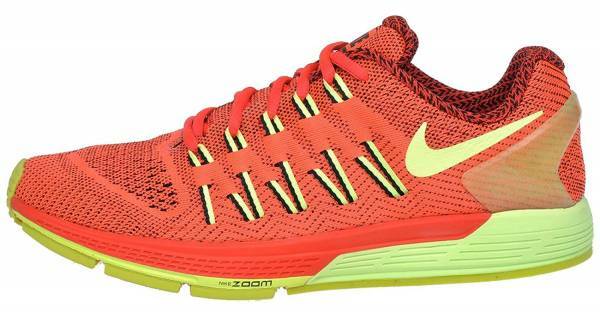 The Nike Air Zoom Odyssey offers excellent stability and support as mentioned in some reviews. This shoe is very comfortable even on long distance runs. This shoe is slightly heavy. The Nike Air Zoom Odyssey is a great running shoe for those runners who are looking for responsive cushioning, comfortable support and stability. It is a stability running shoe that performs well on the road. It is a great partner for your daily running activity. The responsive cushioning ensures that the Nike Air Zoom Odyssey is fast. To all this, add a snug fit along with one of the best cushioning systems in the running business (Air Zoom). This shoe could be your new best friend for all your running needs. It’s very stable, but it runs like an energetic neutral shoe. To all this, add a snug fit along with one of the best cushioning systems in the running business (Air Zoom). Responsive cushioning and a stable ride are part of what the Nike Air Zoom Odyssey offers. This shoe encourages great performance by propelling the runner forward while also delivering active support to the underfoot. Balance for the gait is achieved, thus providing a smoother running experience. Breathable and coverage is afforded by the upper unit of this running shoe, which resembles a woven cloth. It follows the natural movements of the foot, thus allowing the runner to be as flexible as possible. Durable and stretchable cables on the sides provide a snug and customizable fit. The mid-sole unit of this running shoe uses a triple-density foam to adjust the foot and lead it to a more neutral stance. They’re very important in keeping the foot free from any discomfort or injury brought about by an uneven surface contact and body weight support. Having a balanced foot pronation keeps the runner performing in a safe and efficient way. The outsole unit uses a durable rubber compound to provide protection against wear and abrasion. A crash rail design cushions the sole unit and the foot when landing on the ground, making sure that each heel-to-toe transition is smooth and easy. The Nike Air Zoom Odyssey has a regular shoe length. It comes in sizes that follow the standard measurements for men and women. The available width is medium, so this shoe accommodates runners who have medium sized feet. Its semi-curved shape allows the natural shape of the foot to acclimate well to it. The Nike Air Zoom Odyssey uses a Durable Waffle Outsole to provide protection against wear and tear. Surface contact surely is abrasive to the shoe, so this layer actively shields the rest of the sole unit from damage. The same outsole pattern is found in the Odyssey 2 and other Nike running footwear. Flex grooves in the forefoot area ensure that the foot is able to perform in a natural and unrestricted way. Such a design is important for runners because the toe-off phase is the one that requires much of the flexibility of the foot. A Rubber Crash Rail provides durable impact cushioning when landing the foot on the ground. It makes each step easier, softer and more agreeable. The mid-sole unit of the Nike Air Zoom Odyssey uses a triple-density foam to make sure that durable cushioning is afforded to the runner at all times. These varying densities also allow the foot to be stabilized, especially for those who need additional support to slow the rate of pronation. The Zoom Air units are placed in the heel and forefoot sections of this running shoe. These units absorb impact shock and then provide reliable cushioning during the foot strike and the lift. A full-length medial post makes sure that those with over pronated foot motion are going to receive constant support that’s durable and precise. The Nike Air Zoom Odyssey uses the Flymesh technology for its upper unit. It’s a soft, flexible and stretchable material that acclimates to different foot types. It allows air to seamlessly enter the shoe in order to provide a well-ventilated interior environment for the foot. The Flywire Cables are flat and wide strands of durable material that serve as the catalyst for the upper to have a customizable fit. Connected directly to the lacing system, they react to the tightening and loosening of the shoelaces, making sure that the foot feels snug and secure.